Visiting the dentist can be frightening. Asking if autistic children have dental problems is the same as asking if children in general have dental problems. Some do and some don't. Autistic disorders do not have pronounced physical characteristics, and bad teeth are not necessarily an indicator of autism. As with other aspects of the autism spectrum, dental problems in children with autism vary according to the individual. That said, there are some factors that can make dealing with dental problems difficult. The tendency to have bad teeth can be genetic, but it isn't related to autism. In fact, a study from Tufts University in Boston found that people with autism who participated in the study had fewer dental caries and lower DMFT (decayed, missing and filled teeth) scores than their neurotypical peers did. However, the study notes that patients with autism were uncooperative and required general anesthesia for their dental treatments. Children on the spectrum face the same challenges other children do when it comes to dealing with dental problems, but the challenges are magnified significantly. While inherently bad teeth may or may not be present, some obstacles exist. Life skills are easy to take for granted, but people with pervasive developmental disorders often struggle with simple tasks, which may include oral hygiene. A child on the spectrum may not have developed the fine motor skills necessary to brush well. The individual may be able to complete the task, but may fail to brush well enough to be effective. Struggles with daily living skills vary according to the child's abilities, and an occupational therapist can help improve fine motor skills. If the sound of fingernails scratching a chalkboard sends shivers down your spine, you can relate to sensory problems kids with autism face. The difference is that the nettling feeling occurs as a response to common daily activities. Brushing your teeth may not feel uncomfortable to you, but a person on the spectrum may find the sensation unbearable. Autism can lead to uncooperative behaviors, especially when it comes to procedures that invade personal space. Children with autism may become confused and frightened when they are visiting the dentist, which can lead to resistance, and possibly, tantrums. Some have to undergo general anesthesia to have work done on their teeth. Compliance at home can be equally challenging. Many parents have to hold their children down to brush their teeth. Pair that with trying to deal with poor motor skills, and the situation quickly becomes overwhelming. The episodes are so exhausting that some may avoid the conflict, or keep tooth brushing to a minimum. Normally, children are able to tell their parents that they feel pain in their teeth. Children with autism may not have the ability to communicate that something is wrong. This is a serious obstacle that can manifest in negative behaviors that appear to come out of nowhere. Some kids on the spectrum can't say that they are feeling pain, while others may talk about discomfort, but can't articulate where they feel the pain. 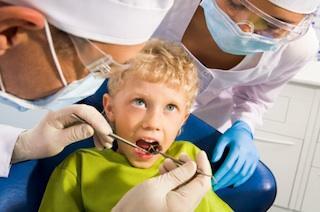 Children with autism have dental problems for the same reasons that typical children have dental issues. Poor oral hygiene, eating sugary foods and failure to see a dentist on a regular basis can contribute to caries and other problems. Kids on the spectrum may be less likely to tolerate braces, which makes correcting crooked teeth difficult. Visiting the dentist can be frightening for any child, but children with autism can have magnified fear that leads to difficult behavior. While many challenges exist, people with autism do not necessarily have more dental problems than anyone else does.